I have a user on my ignore list. They posted to a thread I'm subscribed to and their comment came through in the notification. It would be nice if the notification stated that the post content/user was on my ignore list and suppressed what they posted (notification is ok). Adding users to ignore lists will only suppress their posts in threads you view. It won't hide it in notifications. As it's still classed as a reply to a subscribed thread. It's a shame it doesn't work both ways so the user being ignored can't see your posts either. jammyb - I don't know what you posted (as I don't see it). You may want to do a bit of research to understand what happens when you're on someone's ignore list. For those that aren't on my ignore list, my suggestion still exists. Oh the irony! So ol' tugger is too peeved to press "show this post" and see the answer to his question? And I need to do some research? Oh well, I guess he'll never know! Ha! I could have some fun with this couldn't I! I don't know the story behind this, but please stop the drama. Or at least make it entertaining drama, like one of you have an evil twin. If no one has an evil twin then nothing else should be said and both of you should give each other space. Sounds good? Sounds good. I just made a suggestion. I have no idea what jammyb is posting, nor do I care. In the email notification you can see who posted. If you don't like that guy, simply don't read any further in the mail. Simple, eh? Issue also is that the mail notifications can't easily be adjusted as they are pretty hardcoded and there are no hooks/entry points to alter anything AFAIK. And we won't mess with changing the main source code. Ok, thx for the feedback. I can add a filter to my email client to filter this out. If you're involved with future mods to the software (or have a feedback mechanism) it may be something to consider. That way it is consistent with how ignored users are handled in the forum view. (2014-04-22, 16:50)TugboatBill Wrote: [ -> ] I just made a suggestion. I have no idea what jammyb is posting, nor do I care. You think this is trolling? This was merely banter till somebody called insults! If you want to ban me over a few eff's and jeff's just to make a point. Go for it. Actually, I'm with jammyb on this one. Sure, they could have pulled it back a bit, but no one seemed to be having any argument in the thread where this all started, and TugboatBill wasn't even participating in that thread. 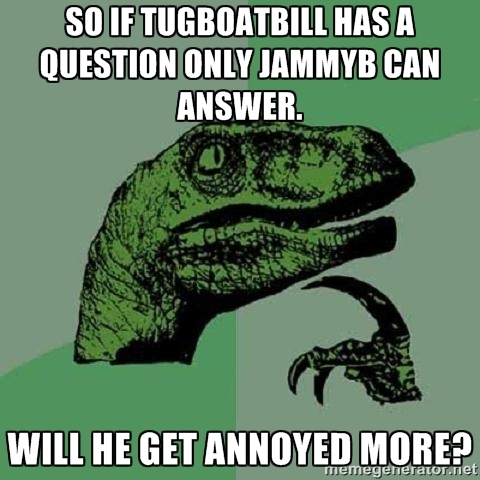 Then out of no where, TugboatBill makes a post just to point out that he has placed jammyb on ignore, knowing full well that will get a reaction out of jammyb. Then he makes this thread, again trying to stir up drama. I'm not saying jammyb was on his best behavior here, sure, but somehow this has oddly escalated to a two week ban on jammyb and no one saying anything to TugboatBill. The better solution here would have been to tell both of them to shut up about it, and the next one who comments on the other then gets a ban of a few days. I meant, make it clear that a ban would result, and I'm certain that both of them would have let the issue slide, resulting in no bans, and everybody gets to move on. At this point I'm not sure it does anything, but whatever.